Is April the “cruelest month” for the S&P 500? Saudi prince MBS, Leonardo da Vinci and… and an art heist? “The plane descended through thick Andean clouds,” says our pot stock authority Ray Blanco… with a turn of phrase resembling the opening line of a novel. Generally, Ray’s work travel takes him far afield from his Florida home — north to Canada or out West to California and Las Vegas. 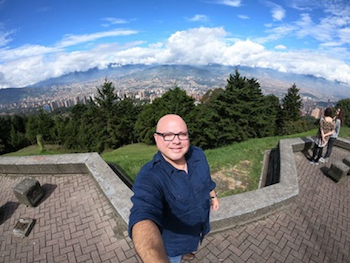 But in this case, Ray traveled south to Medellín, Colombia. Yes, that Medellín… the nexus of a cocaine cartel that turned the Colombian city into a war zone for three decades. At the center, the mysterious and ruthless Pablo Escobar. Then in 1993, after eluding authorities for decades, federales fatally shot Escobar while he was attempting to escape capture by jumping from one rooftop to another. “But there’s much more to Medellín than the story of a fallen drug lord,” Ray says. In the ’80s, Escobar bankrolled a private zoo on his estate because… why not? He smuggled in elephants, giraffes and hippos — among other exotic animals — and opened the zoo to the public. Just your average drug lord giving back to the community… heh. After Escobar died, the Colombian government seized his hacienda and found homes for most of the zoo animals, all except the hippos. The four “cocaine hippos” were left to wallow in a muddy pond and, apparently, procreate. The government estimates there are between 40 and 60 hippos that’ve spread to Colombia’s Magdalena River — now the largest population of hippos outside Africa. “Ever since the government got the upper hand against the narcos and the guerillas,” Ray continues, “the city and the country at large have become prosperous and peaceful. A lot less Narcos… and more HGTV. “Situated near the equator, there’s barely any difference in daylight hours between winter and summer, making flower production a year-round affair using just sunlight. “These factors of geography, along with others,” Ray continues, “have made Colombia into a… powerhouse. “You can grow better and cheaper product — at larger quantities — than almost anywhere else,” he says. So why grow in, say, high-tax California when you can grow marijuana in Colombia’s optimal conditions for less? Rays says: “What I saw [in Colombia] is the future of cannabis.” Something he believes will build generational wealth for investors who buy in early. [Ed. note: 2,382 miles away from Wall Street, shares of one tiny company could explode faster and higher than ever before seen in history. This may be your only chance to turn pocket change into a retirement windfall. But you must act immediately — by MIDNIGHT today. Sure, the market took investors on a roller coaster ride in March. A fallback at the beginning of the month led to a recuperation by the end. The S&P 500, in particular, had its best quarter in 10 years! “March and April have teamed up to deliver the market’s best two-month stretch over the past 20 years. Looking at the markets today, the Dow’s up about 250 points — flying high on hints of a U.S.-China trade-war truce. As for the S&P 500, the index is up 24 points, to 2,858.47; the Nasdaq’s in the green, too — up 77 points, to 7,804.61. Turning to commodities, oil is up, a *shade* under a dollar, to $61.05 for a barrel of WTI. As for gold, it continues its slide, down $1.20, to $1,297. Checking in on palladium — that’s seen a dramatic rise and fall of late — the metal’s up $39.60, to $1,391.40. Bitcoin’s standing its ground: It’s gained $44.20, to $4,139.00. The Commerce Department informs us retail sales slipped 0.2% in February. Here again, the “expert consensus” was confounded: Among dozens of economists polled by Bloomberg, the most optimistic guess was for 0.2% gain. Appears things are going in the opposite direction. On the buy side, you have your money managers who oversee mutual and hedge funds. They’re purchasing stocks for the portfolios they run. In other word, they’re essentially salesmen… not that there’s anything wrong with that. “These sell-side investors have rules that must be followed.” One of the biggest being brokers and investment advisers can only recommend stocks endorsed by their firms. Here’s where things get interesting for retail investors: “You can invest alongside [Wall Street insiders] to make money as their buy orders hit the market,” says Zach. Take, for example, retailer Bed Bath & Beyond (BBBY); last week, shares rallied sharply after activist investors put pressure on the company to oust certain board members and execs. 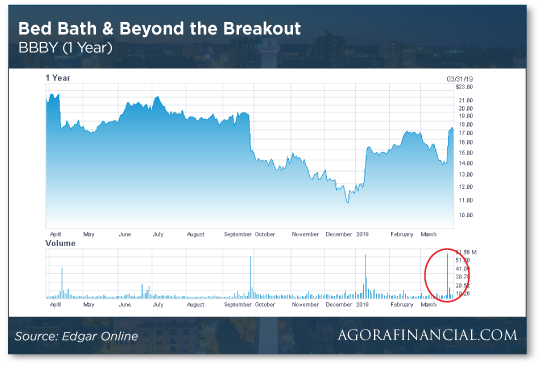 From the chart, you can see BBBY stock spiked last week on the news — and notice the spike in trade volume, too. “But what REALLY caught my eye about Bed Bath & Beyond were the analyst upgrades for the stock,” Zach says. “For BBBY, the news of activist investors caused a handful of sell-side companies to ‘upgrade’ their opinion on the stock,” Zach says. Say, for instance, from a hold rating to a buy. Since most brokers and advisers, however, still do business over the phone or in person… it takes time for word to get out. “So now that BBBY is upgraded,” Zach says, “it could take weeks for these salespeople to call all of their clients and get them all on board buying BBBY. “And during that time,” he says, “the stock should continue to drift higher. That’s why Zach recommended adding BBBY shares to readers’ portfolios when the markets opened this week. Art Heist II? 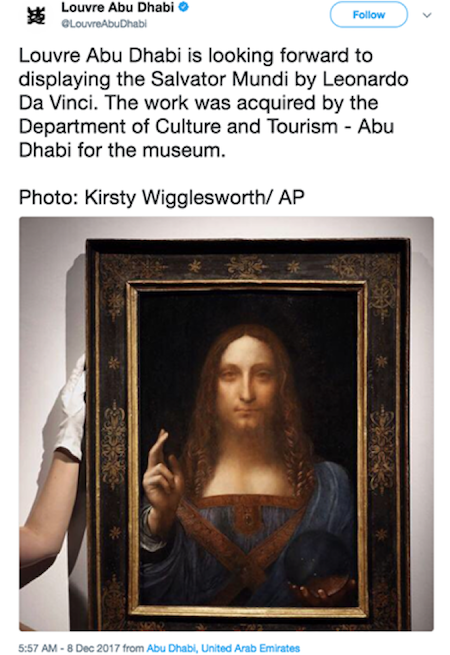 In 2017, The 5 reported a painting Salvator Mundi — loosely attributed to Leonardo da Vinci — was auctioned off at Christie’s… for the princely sum of $450 million. Princely, indeed. The purchase was loosely attributed to Saudi Arabia’s Mohammed bin Salman — or MBS to his buds. At the time, the sale of the painting was noteworthy because of its record-breaking price, to say nothing of the painting’s dubious provenance. “Today the controversy continues as the Louvre Abu Dhabi, which recently announced they would be displaying the painting, canceled the scheduled unveiling without explanation,” according to Inquisitr. Riddle: Is the painting a Leonardo da Vinci? Or was it painted by some Renaissance fanboy? Mystery: Did MBS really buy it… and then sell it to the Louvre Abu Dhabi? Or was it on loan? Enigma: Where is the damn thing?! “I learn something new or with a different slant almost every day reading The 5,” a reader says in response to a question we asked last week about the quality of our content. “Thankfully, I am not as disappointed as the upset customer; however, I feel like I am always getting pitched something,” says our next contributor. “And it takes SOOO long to figure out the premise/intent of the video… or how much it costs! Like, I know you’re trying to sell to me, but it takes so long to even bring it up… it gets annoying. This could be your last chance to turn a small grubstake into a FORTUNE. Click here to get in before MIDNIGHT, April 1.